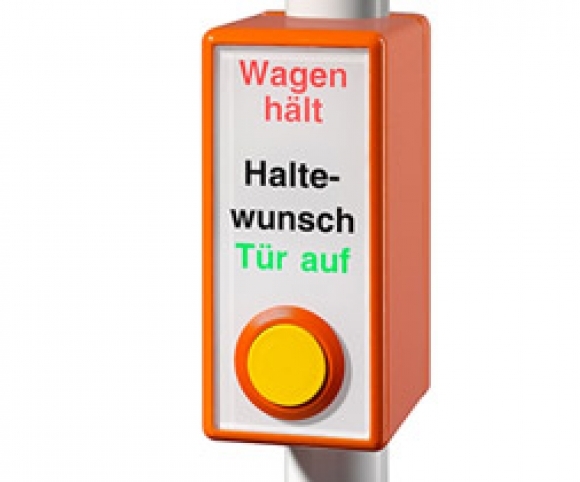 Hand pole Buttons as Stop Request Button in Busses and Trains. From simple stop button up to a door control unit with a two-color back lit display in a metal housing, is this product family offers a wide range of colors, text options and pictographs. The varieties with braille writing and raised pictographs meet the special requirements of organizations like the TSI-PRM for people with reduced mobility. A compact design and a robust housing guarantee the high durability of this product. The use of impact resistant polycarbonate covering protects the pictographs and text from scratches and other damage and thereby aids in the well kept appearance.of the unit.Product types with a heavy metal housing are further protected against vandalism damage.